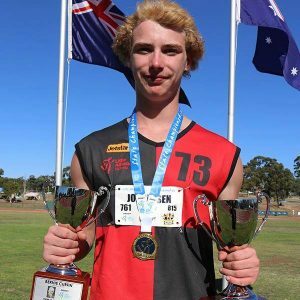 Athletics Essendon has been greatly saddened and shocked by the tragic passing of young member Lachlan Jorgensen. A supremely talented multi-event athlete, Lachlan won multiple national and state medals and holds junior club records in 400m, the 90m and 200m hurdles, and the hammer throw. The club extends its sincere condolences to Lachlan’s friends and family during this extremely difficult time. Essendon athletes are invited to wear black armbands at the opening round of AV Shield in memory of Lachlan.